The item may be used for a single domain only. You must be signed in to make a purchase, if you do not have AS Templates account you will need to crreate it. Creating AS Templates account allows you to download your purchased and free products, get updates, receive special services and much more. Click Proceed to Checkout to signin and complete your order now. Thematic joomla template is built on the robust, user friendly, feature rich, easy to customize and not to mention the responsive layouts support which not only looks good on all browsers and devices but also works extremely efficiently. This template is built using the latest html5 and T3 is built in LESS CSS thus making CSS development more powerful and intuitive. It is always said that LESS is more! With multiple layouts supports such as: Left Content Right, Left Content, Right Content, Multiple columns, Full width, you can display your content flexibly. Integrated with Bootstrap, then Thematic uses typography from Bootstrap with styling for forms, buttons and tables. 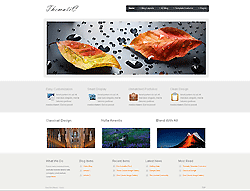 This template is compatible with both versions of Joomla (J!25x and 3x).